Ursuline High School affirms the intrinsic worth of learning as a life-long process that is exciting and personally satisfying. Education is more than accumulating credit hours and meeting graduation requirements. Education at Ursuline High School also includes the formation of inter-personal relationships, formal opportunities for learning within the classroom, informal opportunities for learning which occur outside of the classroom, the development of problem-solving skills, the nurturing of creativity and imagination, and the examination of moral questions across the curriculum. 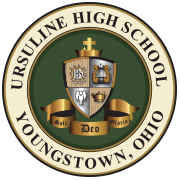 The instructional program at Ursuline High School is designed for the college-bound student but is flexible enough to meet the needs of most students. Remediation and reinforcement of basic skills will be provided as needed through the Auxiliary Service Program. Honors and Advanced Placement sections in English, French, Spanish, American History, American Government, science and mathematics attempt to challenge students who are gifted in those particular areas. Tutoring and small group instruction in math and reading are also available. Computer-assisted instruction and peer-tutoring may be scheduled throughout the school day in the Learning Center. Every attempt is made by the administration, faculty and guidance personnel to properly place students in instructional programs that will provide optimal opportunities for academic success and help students to realistically identify and attain their goals. Our major goals are to instill a love of learning, an appreciation for truth, and a reverence for God’s creation and the power of the human imagination.